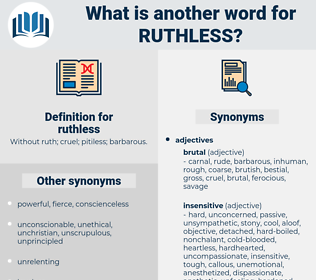 What is another word for ruthless? Without ruth; cruel; pitiless; barbarous. merciless, cruel, brutal, pitiless, unforgiving, callous, relentless, unmerciful, remorseless. harsh, inexorable, fierce, stone-cold, ferocious, severe, grim, inhumane, brutish, barbaric, wanton, absolute, draconian, unrestrained, hard-hitting, barbarous, murderous, unconscionable, inhuman, rough, cruelty, gruesome, horrible, unbridled, brute, bloody, quarrelsome, deadly. heartless, unscrupulous, reckless, unrelenting, implacable, vicious, cut-throat, cold-blooded, tough, atrocious. friendly, giving, compassionate, flexible, forgiving, kind, mild, polite, feeling, tender, considerate, humane, peaceful, civilized, nonviolent, merciful, easy, nice, calm, tame, sympathetic, gentle. cordial, sensitive, affectionate, indulgent, lenient, good-natured, clement, charitable, gracious, warm, understanding, good-tempered, tolerant. How our friend ever did arrive in France is as much of a mystery to me as it was to the Colonel; presumably a ruthless government, having decided it required men, roped him in along with the other lesser lights. We know how she was banished to Bedford Square, and transferred from the ruthless persistency of her mother, to the less stern but not less fixed manoeuvres of Mrs. Bluestone. rootlike, roadless, ruddles, red algae, radiolysis, rhoeadales, ratlike, rodlike, rootless, rutilus, roridulaceae, radiology, reedlike, red delicious, root-like, ritualize, ritualise.